For a warm, lodge look in your space, the Madison Park Westbrook Collection is perfect for you. The unique fabric used in this set has a textured earthy print pieced with polyester microsuede at the bottom and buttons for a personal touch. Three decorative pillows using piecing and embroidery of both top of bed fabrics completing this cohesive look. Set includes one comforter, two matching shams, one bed skirt, three decorative pillows. This comforter set feels like soft suede so if you like the feel of microsuede this comforter is for you. It is also thick so it keeps you nice and warm; it's definitely not thin and flimsy. It is definitely worth the money. 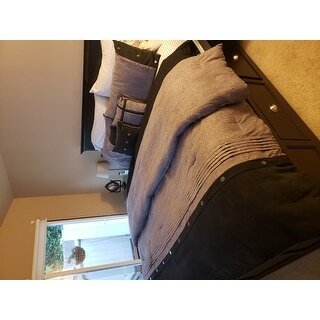 The subtle print on the comforter and decorative pillows look just like the photos show on the website. The buttons at the base of the comforter gives it that extra pop of style. Love this comforter! I'm looking forward to buying more Madison comforters to switch up. Love the set, but, if you are looking for something that can be used in the beginning of fall, spring, summer months this is NOT the set to get. We had to take this off of our bed in late March because it got soooo hot. It's great quality love the feel of the fabric, just really over stuffed if that's even the right statement. Also the shames are way too big for just a queen size pillow mine swim in them. I would recommend this for someone who lives up north, way north. I purchased this set for my son for Christmas who is not one that likes colors too much ( after all, he is a man). 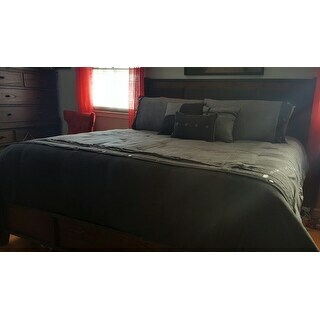 This set was perfect because it was a perfect combination of grays and the buttons on the comforter added a bit more of a masculine touch in my opinion. This set would be beautiful in any bedroom but the color and the design are perfect for my son who loved it! He is very opinionated and very picky about what he puts in his home so I was delighted that he liked it so much. It lays beautifully on his California king size bed and I don't think I could have selected anything any more appropriate of well priced. This set was the only one my husband and I could seem to agree on. The texture is great which is probably the most important thing and it seems well made. I didn't notice until I opened it that the grey isn't a solid grey which is the reason for the 4 stars. It looks almost like a camo grey design and I don't like that. It's also very masculine, which is fine, just an FYI. Solid comforter, especially if you get it in sale. Took away a star because it could use more pillow cases. Also in the image it seems as if the gray and black parts have different textures but it is the same. I really liked the feel and look of this comforter. The colors in the picture match exactly to what was received. It's so soft and warm, and looks beautiful in person! I love the quality, the colors and all the pieces that are included for the price. It is awesome. The fact that the shipping is free is an added bonus. Pieces are pretty good - the bedskirt is pretty flimsy but the pillows & comforter are nice. Feels more of a winter weight. Warm and soft comforter set. This comforter set is so pretty, warm, and I got the king size. Great size for a good price. The comforter set looks so nice in my bed. I will buy more blankets at overstock. The comforter looks great , but be careful don't let a cat or dog lay on it. I would not have ordered it if I know how much trouble it was to keep pet hair off. I had it cleaned and put it away for good. Very nice. Good quality. Just as described. it looked so cheap, returned this immediately. This set looks amazing in my space and is exactly what I was going for, great material as well ! This comforter set came in a very timely manner. The quality is OK very light weight I prefer a heavier better quality but the over all look is very nice the for the price. I prefer spending less and changing more often. This would be a very nice set for a young man's room as well. Wow this is even more beautiful in person than any picture could ever show. Makes my room look very elegant. Have got so many compliments. Great find especially for the price. Beautiful! Nice fabric, love the look!! "I want to order this for my Queen size bed, but all that is available is Cal King would this be too big for my queen?" Yes,this will be to big for a queen size. I have a king size bed and this is perfect. Probably too large for a queen but if you can wait for a queen, you won't be disappointed. The quality is great. "Does this comforter run small or is a true to size?" It will fit true to size. "Has anyone washed this yet? If so, how did it come out. Also, 1 review said it is more of a camouflage design. Does anyone else think that too?" I have this set in the black and brown! I love it, it washes really well but is on the thicker side. My washer is really tiny so its harder to wash. The gray pattern is a stone wash and is pretty identical to the pictures. "This looks as if it would be itchy feel. Can someone let me know that it's not like a wool feel or any itchy type of feel." ABSOLUTLEY NOT!! It feels great! "Is the second main color (accent color) black or charcoal gray?" The second (accent color) is a charcoal gray.